Like fellow landscape painters Pierre Valenciennes and Jean-Baptiste Corot, Bertin came from a family of master wig-makers. 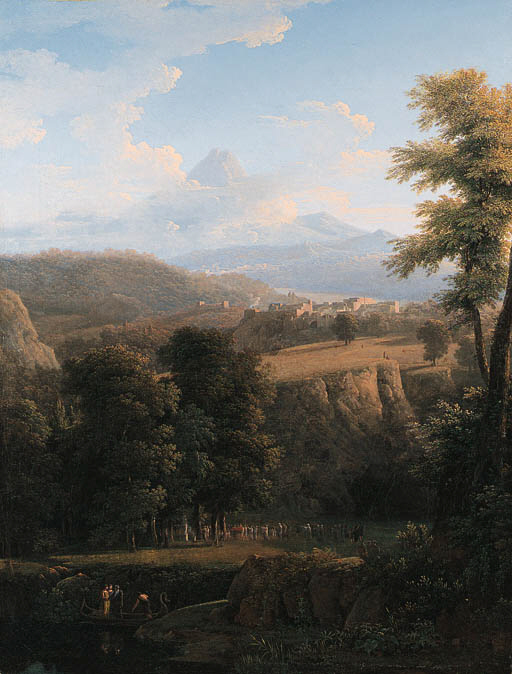 He entered the Royal Academy of Painting in 1785 as a student of Gabriel-François Doyen, but by 1788 is recorded studying under Valenciennes who directed him towards the paysage composé, idyllic Italianate vistas, often with an historical gloss. From 1801 he repeatedly proposed to the Academy the creation of a Prix de Rome in the category of historical landscape, efforts which did not come to fruition until 1817 when the first competition was held, and won by Achille-Etna Michallon. Though he flourished both during the Empire and the Restoration, it is difficult to construct a chronology for his painting as there are no precise documents for his early work. While his early paintings consistently drew on an idealized vision of landscape for inspiration, he eventually turned to painting more from nature. Bertin exhibited regularly at the Salon from 1793 until his death in Paris in 1842. His work was acclaimed and he received awards on several occasions, in particular in the Salons of 1799 and 1808. In 1822 he was decorated by the Legion of Honor. The present work can be compared to a pair of paintings offered at Hôtel Drouot, Paris, March 31, 1995, lot 1.